Below you fill find all funeral homes and cemeteries in or near Atchison. Atchison is also known as: Atchison County / Atchison city. Their current mayor is Mayor David Butler. Zip codes in the city: 66002. Atchison County funeral flowers can be purchased from one of the local funeral shops we partner with. Some of the notable people born here have been: Rory Lee Feek (singer-songwriter and singer). Atchison is a city and county seat of Atchison County, Kansas, United States, and situated along the Missouri River. 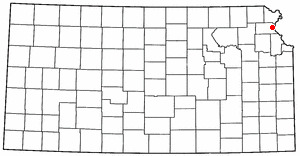 As of the 2010 census, its population was 11,021.The city is named in honor of David Rice Atchison, United States senator from Missouri, and was the original eastern terminus of the Atchison, Topeka and Santa Fe Railway.Atchison was the birthplace of aviator Amelia Earhart, and the Amelia Earhart Festival is held annually in July. Atchison is also home of Benedictine College, a Catholic liberal-arts college. It was written by Topeka Capital-Journal on March 3rd, 2019 that Cloud L Jr "Bud" Cray perished in Atchison, Kansas. Cray was 96 years old and was born in Detroit, MI. Send flowers to express your sympathy and honor Cloud L Jr "Bud"'s life. It was reported by Topeka Capital-Journal on November 18th, 2018 that Donald J Handke perished in Atchison, Kansas. Handke was 93 years old. Send flowers to express your sorrow and honor Donald J's life. It was reported by Topeka Capital-Journal on October 12th, 2018 that Doris Louise Weishaar (Schneider) passed away in Atchison, Kansas. Ms. Weishaar was 97 years old. Send flowers to express your sympathy and honor Doris Louise's life. It was disclosed by Topeka Capital-Journal on June 10th, 2018 that Elaine L Drennon perished in Atchison, Kansas. Drennon was 55 years old. Send flowers to share your condolences and honor Elaine L's life. It was revealed by Hutchinson News on May 25th, 2018 that Beth Lois Sherlock passed away in Atchison, Kansas. Sherlock was 91 years old. Send flowers to express your sorrow and honor Beth Lois's life. It was revealed by Topeka Capital-Journal on May 17th, 2018 that Dorothy Mae Ball (Burg) perished in Atchison, Kansas. Ms. Ball was 86 years old. Send flowers to share your condolences and honor Dorothy Mae's life. It was reported by White Oak Independent on May 10th, 2018 that Shirley Mizell (Bennett) died in Longview, Texas. Ms. Mizell was 75 years old and was born in Atchison, KS. Send flowers to express your sympathy and honor Shirley's life. It was noted by Topeka Capital-Journal on February 25th, 2018 that Lawrence E Jr "Larry" Hart died in Atchison, Kansas. Hart was 61 years old. Send flowers to express your sympathy and honor Lawrence E Jr "Larry"'s life. It was reported on February 4th, 2018 that Arlene Marie Feyen (Wilson) passed on in Atchison, Kansas. Ms. Feyen was 82 years old. Send flowers to express your sorrow and honor Arlene Marie's life. It was reported by Topeka Capital-Journal on February 2nd, 2018 that Mary "Sister Mary Arthur" Kratina passed away in Atchison, Kansas. Kratina was 93 years old. Send flowers to express your sorrow and honor Mary "Sister Mary Arthur"'s life. In July 1883, the free-delivery system was inaugurated. Million had a ferry, on which he crossed to the Missouri side of the river to his home, but on the day the prospectors arrived he was on the Kansas side. Million and Samuel Dickson had staked claims near the river. At his meeting on the 21st, two public institutions of vital interest to a new community were planned for—a hotel and a newspaper. Million's claim lay south of what is now known as Atchison Street and consisted of a quarter section. The official website for the city of Atchison is https://cityofatchison.com/. He was awarded the Kansas State Meat Processor of the Year in 1971 ... Memorial contributions can be made to the Atchison United Methodist Church. Becker-Dyer-Stanton Funeral Home, Atchison, was in charge of arrangements. Funeral services will be at 2 p.m., Friday ... Studies from Sterling College and received his Masters of Physical Education from Kansas University. He was a teacher at Atchison High School, where he was also a football and basketball coach. Listing all funeral homes in Atchison, Kansas so you can easily send flowers to any location (same day delivery) or find any funeral service. We work with local florists and flower shops to offer same day delivery. You will find budget sympathy flowers in Atchison here. Our funeral flowers are cheap in price but not in value.